The remarkable rise of China in the last three decades has had a mixed global reaction. While many countries have welcomed this rise, some of China’s neighbours have viewed it with concern if not consternation. What does the rise of China signify for India, given our none too smooth relationship with China and latter’s unqualified support to Pakistan in military and nuclear field? What do our leading companies feel about China? Would the Indian Ocean be the scene of stiff confrontation between India and China? Or is “China Threat” an exaggeration or hype as some would hold? This book is the result of intense discussions on the above questions in a seminar held on Dec 20/21, 2011 at the National Institute of Advanced Studies, Bangalore. 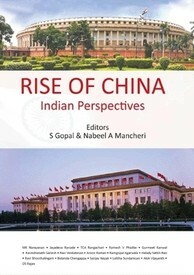 The Chapters in this book, based on papers presented by leading experts on China both from the Government and the Private sectors covers almost all aspects of China from internal political developments, foreign policy to economy, S&T developments and Strategic capabilities, particularly with respect to India. China’s growing military and economic clout and impressive advances in trade and technology have all been analyzed by various speakers who are well known for their expertise on china. China’s views on India have also been brought out succinctly. The Seminar was the first major interaction on a subject of strategic national interest. It is hoped that the book would contribute to better understanding of China by both the interested citizens of this country and the policy makers. S Gopal is Sir Ashutosh Mukherjee Visiting Professor in the International Strategic and Security Studies Programme, NIAS, Bangalore. Nabeel Mancheri is Assistant Professor in the International Strategic and Security Studies Programme, NIAS, Bangalore.